Presentation at DorkBotSF on 24 June 2014 by Balint Seeber, Austin Epps, and John Malsbury. We had an even greater DSN pass today with ISEE-3. We managed to get ~30 minutes of data (11 range points) after achieving 2 way Doppler lock and ranging at a 47.5 kHz offset. Morehead State University was listening and recording during this session (more on that soon). Earlier today we had a pass at Arecibo. Today's task was to take some time to probe the way that ISEE-3 listens - and responds - to commands. It has some quirky behaviors that we are still trying to fully understand. We also got permission from NASA to communicate with ISEE-3 through 16 July using both Transponder A and B. Our Spin-up and Trajectory Correction Maneuvers should be happening in the next week or so. Stay tuned for updates. "After 31 years in space, ISEE-3 is finally coming home. The International Sun-Earth Explorer 3 was a humble satellite launched in the late 1970s to monitor solar winds - until Robert Farquhar commandeered and reprogrammed it to help the United States become the first country to encounter a comet. Now, a team of scientists have come together in an unofficial effort to awaken the sleeping spacecraft and return it to its original spot -- and function -- by combining old technology with new. Next week, if all goes well, the team will command the satellite to fire its engines once again to orbit the Earth and monitor the Earth's weather. NPR's Nell Greenfieldboyce speaks with Here & Now's Jeremy Hobson about Farquhar's efforts in the 1970s and now." 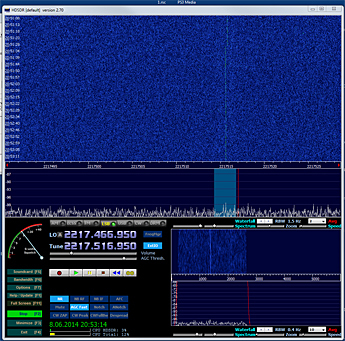 Just as our DSN window closed today we were able to get 2 way Doppler lock and ranging at 47.5 kHz offset. DSN got the four ranging points needed from ISEE-3. 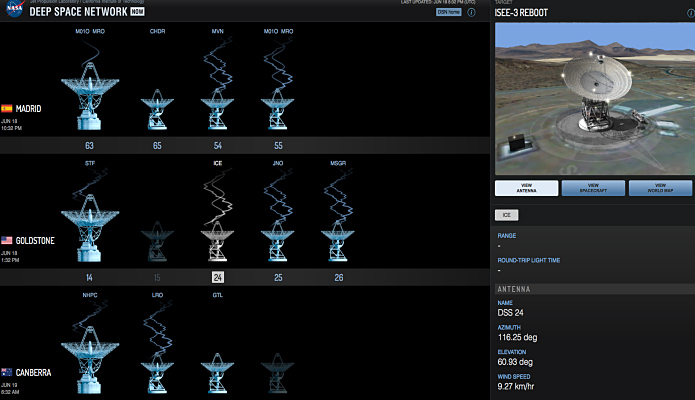 This is the first time since 1999 that DSN has talked to the spacecraft. A follow up session tomorrow should get us a lot more recording time. "The RockOn Terrier-Improved Orion sounding rocket containing multiple student-built experiments launched successfully at 7:21 a.m. EDT on June 26, 2014 from NASA's Wallops Flight Facility in Virginia. The payload was recovered and has been returned to Wallops. The students will conduct their preliminary analysis on their experiments later this afternoon. According to the preliminary information, the payload flew to an altitude of 73.3 miles and landed via parachute 43.9 miles from Wallops Island in the Atlantic Ocean 12.16 minutes after launch." 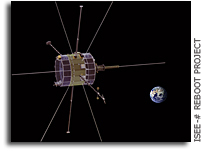 "The ISEE-3 mission was launched in 1978. For those people that remember and who lived in that decade, computers and communications weren't near as sophisticated back then as they are now. Back then, Mattel's "Football," an electronic game using LED dashes representing the football and players, was considered pretty fancy (I was so happy to get one for my birthday). The "Speak & Spell" debuted in 1978 (how would ET ever have gotten home without one?). The Commodore PET, Apple II, and Radio Shack TRS-80 were some of the big names in computing during 1978 (a person could max out the Apple II's RAM with 48k)." "With ISEE-3 rebadged as the International Cometary Explorer, or ICE, Farquhar devised a flight path that rounded another libration point on the opposite side of the planet, boomeranged repeatedly around Earth and the moon, then used lunar gravity to sling the spacecraft through Giacobini-Zinner's plasma tail. From there, it would orbit the sun for eternity with a brief swing by Earth on Aug. 10 of this year. None other than science fiction author Arthur C. Clarke described the stunt as a mind-boggling feat. "ICE's track looks like a plate of spaghetti, dropped from a considerable height," Clarke wrote in his autobiography, "Astounding Days." During our session with Arecibo today we came very, very close to firing the thrusters on ISEE-3 for its spin-up maneuver. But we were not able to complete the process and fire the thrusters. The spacecraft was completely configured for a thruster firing during today's pass. We reduced the number of pulses from 11 to 1 to make certain that we had the proper commands in place. If that engine firing proceeded successfully we'd follow with the remaining 10 pulses so as to spin up the spacecraft to the required rotation rate. As it happened we were unable to get confirmation on the very last command and put a halt to the procedure. Continue reading ISEE-3 Status 24 June 2014: We Almost Did The Spin-up Burn. "NASA is launching two challenges to give the public an opportunity to create innovative ways to use data from the agency's Earth science satellites. The challenges will use the Open NASA Earth Exchange. OpenNEX is a data, supercomputing and knowledge platform where users can share modeling and analysis codes, scientific results, knowledge and expertise to solve big data challenges in the Earth sciences. A component of the NASA Earth Exchange, OpenNEX provides users a large collection of climate and Earth science satellite data sets, including global land surface images, vegetation conditions, climate observations and climate projections." Continue reading Updated Ephemeris for ISEE-3 at JPL Horizons 23 June 2014. The pass began with a +/- 3 KHz sweep across frequencies representing the input frequency of transponder A (2090.66) MHz + the Doppler offset + an additional 11.25 KHz that came from our most recent command session. The additional offset is due to thermal and or aging issues with the spacecraft transponder. The sweep is done with a carrier only, no modulation, to get the receiver on the spacecraft to lock to the DSN transmitted signal. The output of transponder A will start to vary in a 240/221 relationship when the carrier is locked. Then ranging can occur. The sweep was unsuccessful in establishing a coherent lock. The sweep rate was 60 Hz/sec. This conforms to the procedure used in 1985 by the DSN for the spacecraft during the ICE comet encounter. Continue reading ISEE-3 Status Report 23 June 2014: DSN Ranging & Spin Up Update. "Thirty-two undergraduate students from a like number of colleges and universities are participating in an eight-week NASA Airborne Science Program field experience designed to immerse them in the agency's Earth Science research. Flying aboard NASA's DC-8 airborne laboratory, students will measure pollution, aerosols (small particles suspended in the atmosphere) and air quality in the Los Angeles basin and California's central valley. They will also use remote sensing instruments to study forest ecology in the Sierra Nevada and ocean biology along the California coast." "Many NASA centers have established groups dedicated to young professional networking and career development activities. While some groups are more established than others, there is a shared interest across the community to enable young NASA employees to connect with their peers and colleagues at their centers and across the agency. Group activities include virtual workshops and panels, "lunch and learn" events, discussions with seasoned employees, book clubs, and community service. The Academy covers stories about the young professional community at NASA and abroad and has aggregated the following information about center groups in order to better connect the community." Animation by Mike Loucks/SEE: Original trajectory from 1978-1985 showing L1 orbit, cool billiard-ball action w/the Moon and then escape. It gets really interesting around 3:10. Continue reading Our Donors (In Chronological Order). The Centennial Challenges Program is NASA's flagship program for technology prize competitions. The Centennial Challenges Program directly engages the public, academia, and industry in open prize competitions to stimulate innovation in technologies that have benefit to NASA and the nation. The program is an integral part of NASA's Space Technology Mission Directorate, which is innovating, developing, testing, and flying hardware for use in NASA's future missions. After our first attempt to do DSN ranging yesterday we discovered that we need to put ISEE-3 into coherent ranging mode and then promptly issue commands. If we wait too long the spacecraft will drop out of coherent ranging mode. We've been suspecting that this has been an issue before. So, we are working with DSN to resolve this issue in advance of our next ranging attempt. As such, our Sunday DSN pass has been cancelled. The next opportunity will be on Wednesday from Canberra, Australia. Further information can be found at "ISEE-3 Reboot Project Scheduled for DSN Doppler and Ranging Activity". In the mean time, due to some pulsar observations that need to be conducted at Arecibo, we have moved up our ISEE-3 Spin-up burn to tomorrow, Friday 20 June. Our window at Arecibo opens around 1:18 pm EDT. We'll be performing the burn during the following several hours. For more information on this burn and the ISEE-3 pripulsion system check out these links. Tim Reyes (ISEE-3 team member): I sought someone to write a song. Local friends pointed to me and I was given a chance to contribute in this way to bring public awareness back to the long-lost spacecraft, ISEE-3. Continue reading Video: The ISEE-3 Song. 'Sunspots' and 'solar storms' are the feature of an ambitious project being launched internationally by astrophysicists at Trinity College Dublin today. Members of the public will work as part of a global team to better understand sunspot and solar storm phenomena and their impacts on Earth. They will do this by 'rating' the relative complexity of each sunspot image they see on the Sunspotter website, based on its size, shape and arrangement of 'magnetic blobs'. "Engineering is enjoying a moment, thanks to the maker movement, a cultural phenomenon that encourages everyday citizens to design, build and create. "Making encompasses everything from electronics and robotics to woodworking and traditional arts and crafts," says Pramod Khargonekar, assistant director for Engineering at the National Science Foundation (NSF), "and the movement is poised to change the way we think about engineering--from where it happens to who can do it." We have now confirmed that both ISEE-3 transponders - A & B - are in coherent ranging mode. We have a very strong confirmation (correct number of commands accepted) that transponder A is in coherent ranging mode and we have reasonably strong confirmation that transponder B is also in coherent ranging mode. We are now set up and ready to go for our first ranging session with DSN on 18 June. 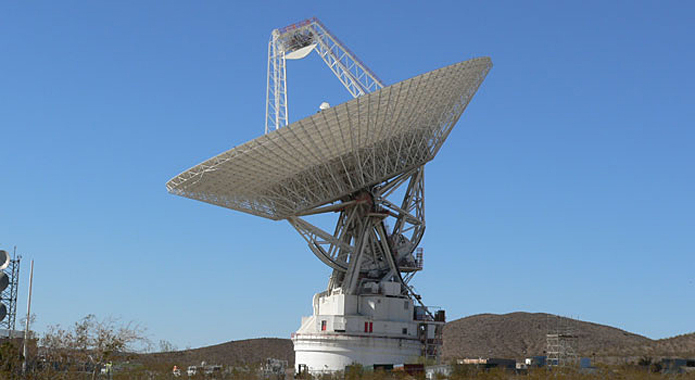 Our first session will use DSS-24, a 34 meter dish with 20kW transmitter located at Goldstone in California. If this ranging session with DSN is successful then we will proceed with plans to briefly fire two of the spacecraft's thrusters on 21 June so as to spin it up from 19.16 rpm to the mission specification of 19.75 +/- 0.2 rpm. Our spin-up target is 19.733 rpm, which is an increase of 0.573 rpm from the currently observed 19.16 rpm. 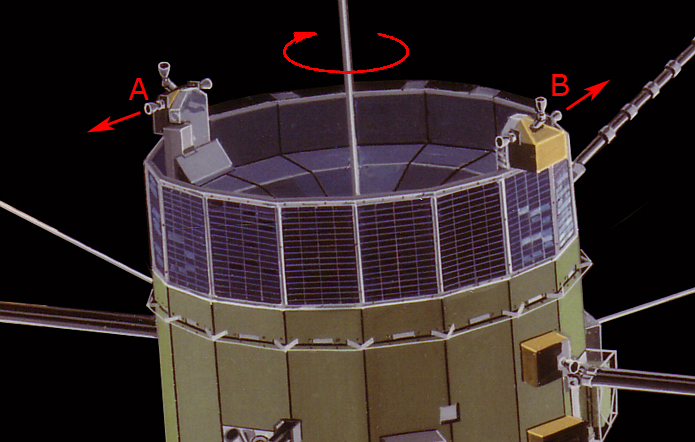 This burn would utilize spin-up thrusters A and B (see image above - larger view) at a 22.5 degree pulse-width. There would be 11 pulses, taking 34 seconds to complete, with a total fuel usage of 0.0418 pounds. This optimal spin rate is required in order to properly fire the axial thrusters during the much longer trajectory correction maneuver (TCM) we need to perform to adjust the spacecraft's course. That TCM burn is now scheudled to happen between 30 June and 2 July. "Students and educators from across the United States will become "rocket scientists" during two workshops at NASA's Wallops Flight Facility in Virginia this month. The seventh annual RockOn! workshop, conducted in partnership with the Colorado and Virginia Space Grant Consortia, will provide 61 community college and university students and instructors the opportunity to learn how to build a scientific payload for a suborbital rocket flight. This workshop is June 21-26." According to Viljo Allik in Estonia "I did another ISEE-3 receive test today. Results are added to the previous files here: http://193.40.1.117/public/p_DSN/ISEE3/ In the demodulated signal spectrum of the the last images it is possible to see the doppler shift caused by spacecraft rotation." "Mr. Wingo has now persuaded NASA to use the Deep Space Network to pinpoint ISEE-3's trajectory, to calculate the rocket burn required to put it on a path to Earth orbit. Dr. Farquhar's 1986 calculations were close, but not exact. Slight errors are magnified over time, and now the uncertainty is 20,000 miles, which means the spacecraft could be on course to splat into the moon. "It is in the agency's best interest to find out, one way or the other," Mr. Wingo said. If everything goes as hoped, ISEE-3 will end up in its original location to observe solar wind, fulfilling Dr. Farquhar's promise to return the spacecraft." "NASA has given approval so far for the ISEE-3 Reboot Project to speak to the spacecraft until June 25, but Cowing said he has every confidence the window will be extended. Then, when the spacecraft is ready, he has some big plans for outreach -- including a website where people can get near-real-time information on how the spacecraft is performing. "We will have an online presence on the spacecraft that rivals NASA's" or is even better, Cowing said, adding he will announce partners on the project when the time is right." 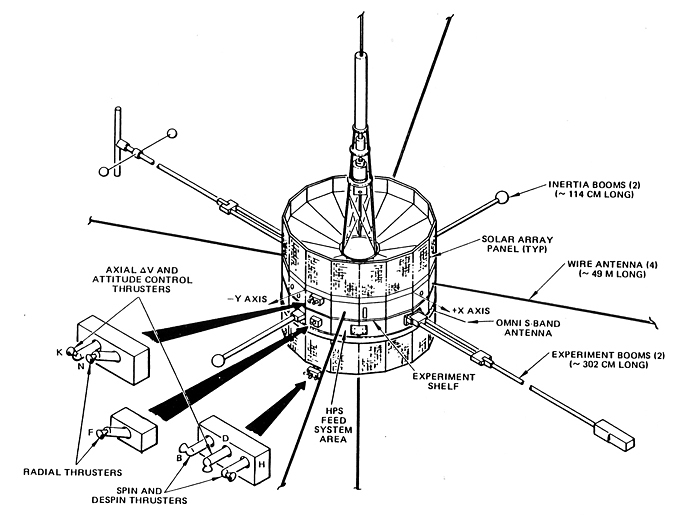 The ISEE-3 spacecraft is a 16-sided drum-shaped structure designed for spin-stabilized operation. [click on image to enlarge] It measures 161 centimeters in height and 174 centimeters in diameter and had a nominal mass of 457 kilograms at launch. The solar array covers the side of the spacecraft except for a band near its center from which various booms and antennas extend. Continue reading ISEE-3 Propulsion System Overview. NASA has given us approval to fire the spin thrusters on ISEE-3 to increase its spin from 19.16 rpm up to the mission specification of 19.75 +/- 0.2 rpm. This spin rate is required in order to properly fire the axial thrusters during the much longer trajectory correction maneuver (TCM) we need to perform to adjust the spacecraft's course. We do not yet have a specific target date for this spin-up burn. This will also serve as our initial test of the functionality of the ISEE-3 propulsion system in preparation for the much longer TCM burn between 30 June and 2 July. Update: we are now targeting Saturday 21 June as the date for our spin-up maneuver. 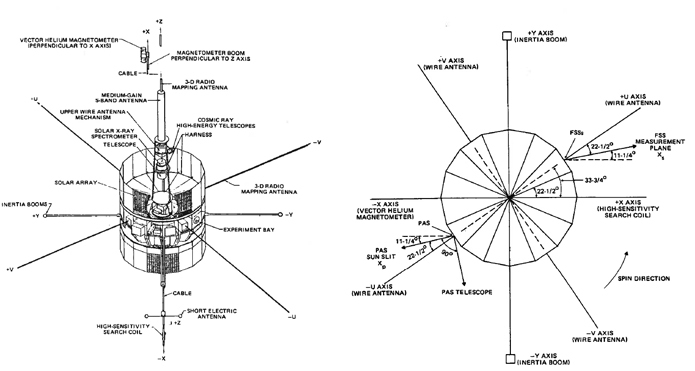 See ISEE-3 Propulsion System Overview for a more detailed description of the ISEE-3 propulsion system. We have received confirmation from NASA that we have been confirmed for time on the DSN (Deep Space Network) for two-way Doppler and ranging activities with the ISEE-3 spacecraft. This is being done so as to determine the location of ISEE-3 with great precision for navigation purposes. Based on this data we will conduct our course correction engine firing. We have moved that original firing date from 17 June to a window that currently covers 30 June and 2 Juy. As the DSN ranging data comes in that window will shrink. DSN ranging passes after the engine burn will help us calculate the result of that burn and the new trajectory that ISEE-3 is pursuing. DSN opportunities have been identified for 18 & 22 June and 3, 4, 6 July. We will probably need to actually utilize less than half to a third of these opportunities. Among the dishes to be used will be DSS-24 at Goldstone, DSS-34 and DSS-45 at Canberra, and DSS-54 and DSS-65 at Madrid. You can watch live DSN activity at DSN Now. Over the next few days we will be configuring ISEE-3 via Arecibo so as to be able to interact with DSN during this ranging activity. Here are the DSN windows that have been identified. Again, we'll only be using a fraction of them since the DSN has lots of other customers. "After passing the last NASA test, Made In Space will see its 3D printer launched to the International Space Station (ISS) in August by SpaceX as part of NASA's 4th Commercial Resupply mission (CRS-4). Originally the 3D printer was scheduled to fly on the SpaceX CRS-5 mission but because the company met all its milestones early the launch was moved up to CRS-4." "We present Brut, an algorithm to identify bubbles in infrared images of the Galactic midplane. Brut is based on the Random Forest algorithm, and uses bubbles identified by >35,000 citizen scientists from the Milky Way Project to discover the identifying characteristics of bubbles in images from the Spitzer Space Telescope. We demonstrate that Brut's ability to identify bubbles is comparable to expert astronomers. We use Brut to re-assess the bubbles in the Milky Way Project catalog, and find that 10-30% of the objects in this catalog are non-bubble interlopers." "NASA and the National Space Grant Foundation have selected five universities to design systems, concepts and technologies to enhance capabilities for deep space missions for the 2015 Exploration Habitat (X-Hab) Academic Innovation Challenge. The selections are the first milestone in a yearlong design and development effort for these five projects. Throughout the 2014-2015 academic year, the teams must meet a series of milestones to design, manufacture, assemble and test their systems and concepts in close cooperation with members of the NASA Exploration Augmentation Module (EAM) concept team." "This year's Rocket Experiments for University Students (REXUS) campaign has been completed. Eight student experiments reached the stratosphere on two rockets. Now the hard work of analysing the results begins. 20 May 2014 was the day it all became real. For 18 months, students had been working to develop experiments and apparatus. Now, 46 of them were gathered at the SSC Esrange Space Center in northern Sweden, and their rocket flights were just a week away." "We describe a system that builds a high dynamic-range and wide-angle image of the night sky by combining a large set of input images. The method makes use of pixel-rank information in the individual input images to improve a "consensus" pixel rank in the combined image. Because it only makes use of ranks and the complexity of the algorithm is linear in the number of images, the method is useful for large sets of uncalibrated images that might have undergone unknown non-linear tone mapping transformations for visualization or aesthetic reasons." Viljo Allik, ES5PC, a member of ESTCube-1 student satellite team at Tartu Observatory, Estonia writes: "I did some receiving experiments today, both on 2217.5 MHz LHCP and 2270.4 MHz RHCP. The RHCP carrier is a few dB-s stronger than LHCP. 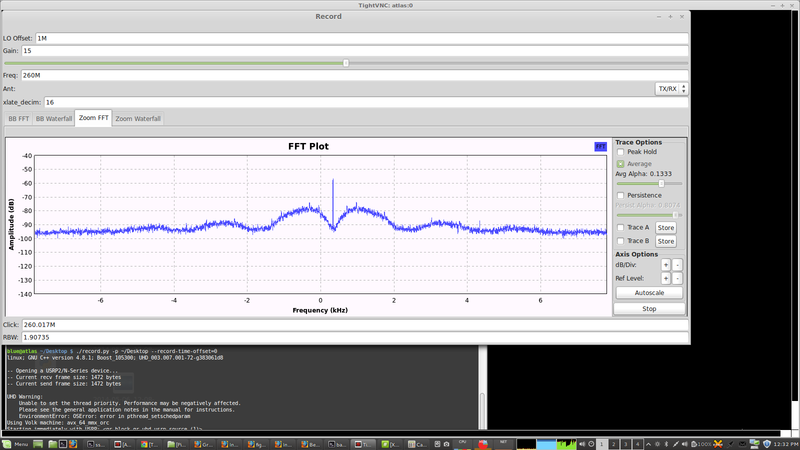 Up to 10 dB carrier to noise can be seen in 1Hz bandwidth with my 4.5 m moonbounce dish at home and G4DDK preamp. Using Ettus Research USRP N210 as a receiver. Its reference frequency is locked to a high precision 10 MHz rubidium clock. If any help for a precise frequency measurement of ISEE-3 is needed, I can do it with even higher precision using the 3m dish setup at Tartu Observatory which has more precise GPS locked rubidium clock frequency available. 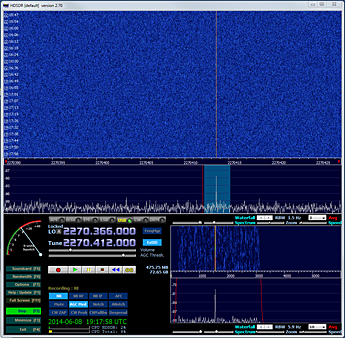 Also I can make SDR I/Q data recordings of the signal and make them available on our webserver.Some SDR screenshots are available at: http://193.40.1.117/public/p_DSN/ISEE3/ Please note that times on SDR screenshots are UTC+3 hours except from the middle of the second 2270 waterfall image where I changed it to UTC. " According to our team "The frequency offset is ~18025 Hz on Spectravue, so it looks likely. He's tuned to XB, so just seeing the very tip of the PM carrier." 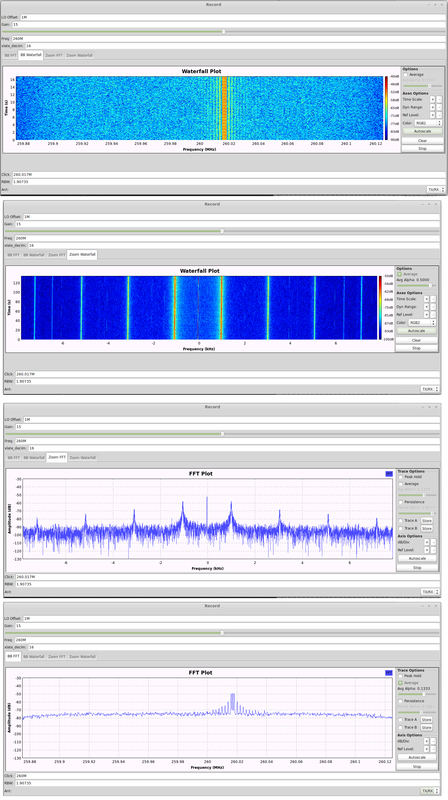 Continue reading HAM Operator Detection of ISEE-3 With an 8 Foot Dish. This is what ISEE-3 really looks like. 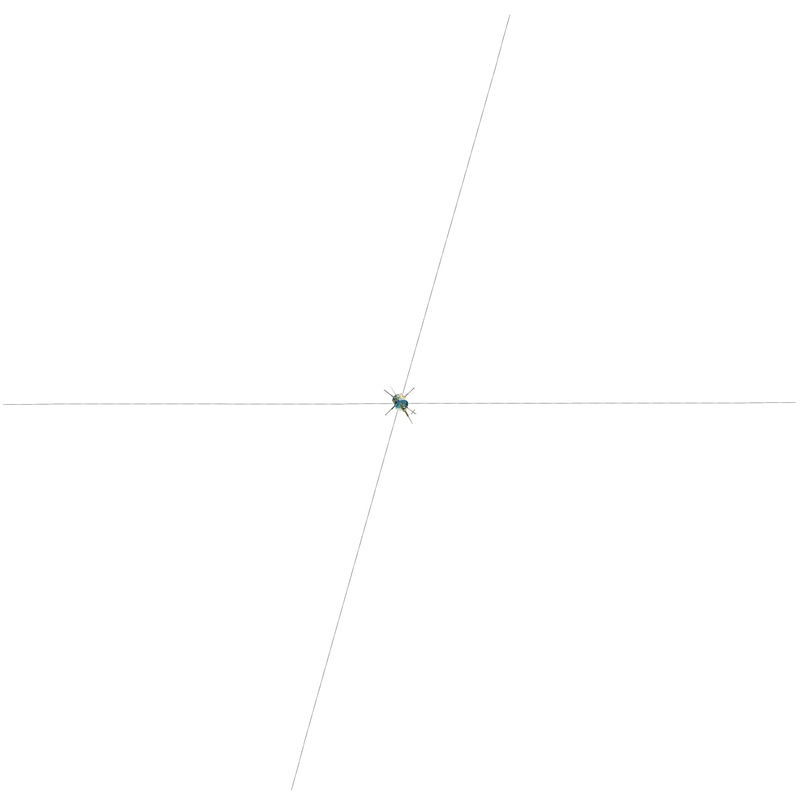 It has 4 large antennas that span 91 meters and it spins at 19 rpm - once every 3 seconds. Click on image to enlarge. "A group of space enthusiasts and vintage hardware experts walk into a radio observatory. They contact a 36-year-old spacecraft to ask how it's doing. The spacecraft responds and says it's well. The group leaves and continues to stay in touch with the spacecraft from their laptops, working out of an old McDonald's building at the NASA Ames Research Center. It's no joke--that's the latest news coming from the ISEE-3 Reboot Project, a crowdfunded effort to repurpose NASA's International Sun-Earth Explorer (ISEE-3), launched in 1978 on a mission to study Earth's magnetosphere. In 1983, ISEE was sent on a new mission to study comets Giacobini-Zinner and Halley, and has been spent the past three decades circling the sun in roughly the same orbit as Earth." 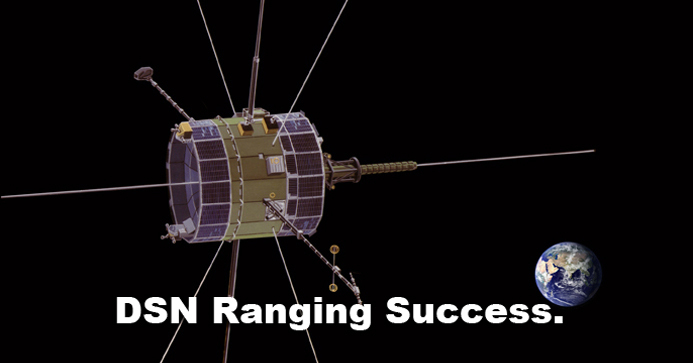 Continue reading ISEE-3 Reboot Project In The News. Here is what 64bps telemetry looks like coming from ISEE-3 after our successful remote commanding today. Click on image to enlarge. Today's pass with ISEE-3 at Arecibo was under command from a laptop located at the offices of our team member Ettus Research. We commanded ISEE- 3 to switch Transmitter A into coherent ranging mode and sent tones to test it. This will help us better determine its exact location. We commanded Transmitter B into 64 bps mode on engineering telemetry and then switched it back to 512 bps. Our next session with ISEE-3 will be on Monday. UPDATE (2014-Jun-05): Trajectory updated to JPL solution #21 (s21), based on coarse Arecibo plane-of-sky angular measurements (not delay/Doppler). Continue reading Updated Ephemeris for ISEE-3 at JPL Horizons. As many of you have probably read, the ISEE-3 Reboot Project was able to successfully send uplink commands to the space craft. This was accomplished through a lot of team work, strong leadership by Dennis Wingo, and generous support from the community at large. Balint Seeber and I were fortunate enough to work on the communications for this project. When you tell most people that you designed a deep-space uplink modulator in a couple of days, there is a good chance that they will be fairly impressed. In reality though, products like the Ettus Research USRP, the open source SDR framework GNU Radio have made this exceedingly easy. We're just building off the work of many people before us! Let's talk about how this "magic" works! У космоса есть нехорошая особенность: он быстро надоедает. И так же, как сорок лет назад «приелся» человек на Луне, сегодня мало кого восхищают гоняющие по Марсу роботы и парящий рядом с кольцами Сатурна зонд. Интерес подогревают новые яркие свершения -- но попробуйте-ка совершить что-нибудь из ряда вон, когда мы были почти везде и видели почти всё в Солнечной системе! Впрочем, как раз сейчас неподалёку от Земли (меряя в космических, конечно же, масштабах) разворачивается эксперимент, подобного которому ещё действительно не было: энтузиасты пытаются спасти космическую станцию ISEE-3 -- и это им почти удалось! "宇宙愛好家のグループ「ISEE-3 Reboot Project」は5月29日、放棄されていた宇宙探査機International Sun-Earth Explorer 3（ISEE-3）との双方向通信を確立したと発表した。 ISEE-3は1978年に打ち上げられた衛星で、1980年代に太陽風の研究等に使われた。 ミッション完了後、NASAは月の引力を使い、ISEE-3を地球へと向かう太陽中心の軌道に放り込んだ。ISEE-3との通信は、1998年に正式に停止された"
"Wszystko zaczęło się od tego, że Robert Farquhar porwał satelitę. W 1982 roku był w NASA naukowcem zajmującym się planowaniem trajektorii lotu pojazdów kosmicznych tak, by wykorzystać przyciąganie Ziemi, Księżyca i innych obiektów do umieszczenia sondy tam, gdzie była potrzebna. Był w tym tak dobry, że potrafił - bez strat dla misji - tak zaplanować trasę lotu, by jego kluczowe momenty przypadały na przykład w czyjeś urodziny." Screengrab of today's ISEE-3 pass as observed at Arecibo and operated remotely from ISEE-3 Mission Control at Moffett Field, CA. Click on image to enlarge. We are doing a receive run - NOW - from Arecibo controlled via laptop from ISEE-3 Mission Control at McMoons in northern California. Taking data received on 29 May 2014, we have performed demodulation, error correction, and frame construction. Approximately 1,000 frames of telemetry have been received and processed. 773 Frames were received with no errors. More telemetry processing is currently underway. Using the Arecibo 130 arc second beam width allowed our team to improve the ranging solution over the baseline JPL Horizons (2001 circa) data. Using Arecibo and asteroid-style orbit determination, this resulted in an improved ephemeris. It also reduced the Trajectory Correction Maneuver (TCM) burn from 50-60 m/s to <10 m/s. This reduces post-lunar flyby dV to <10 m/s for ESL-1 insertion. We have received authorization from NASA to communicate with (and command) ISEE-3 until 25 June. Meanwhile, analysis of telemetry from ISEE- 3 shows that *ALL* of its science instruments are still powered on. Telemetry also shows that ISEE-3 has a power margin of +28 watts - after 36 years. It is important to note that ISEE-3 has not had a functioning battery for decades. Indeed, this power capacity is what was projected for the spacecraft to have had in 1982 after 4 years in space. Telemetry we have received from ISEE-3 shows that it is spinning at 19.16 rpm. The mission specification is 19.75 +/- 0.2 rpm. We have also learned that the spacecraft's attitude relative to the ecliptic is 90.71 degrees - the specification is 90 +/- 1.5 degrees. In addition, we are now receiving information from the spacecraft's magnetometer. 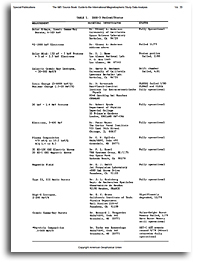 In accordance with the National Aeronautics and Space Act (51 U.S.C. S 20113), this Agreement is entered into by the National Aeronautics and Space Administration, Ames Research Center, located at Moffett Field, CA 94035 (hereinafter referred to as "NASA" or "NASA ARC") and Skycorp, Inc located at 23500 Treeview Trial, Los Gatos, CA 95033 (hereinafter referred to as "Partner" or "Skycorp"). NASA and Partner may be individually referred to as a "Party" and collectively referred to as the "Parties." Skycorp Incorporated was founded in March of 1998 as a Delaware C Corporation by Dennis Wingo; Skycorp was additionally qualified and authorized to transact intrastate business in California on February 15, 2011. Skycorp has designed power systems and avionics for sounding rockets, qualified a COTS payload for Radio Shack that flew to ISS, designed large telescopes, on orbit servicing systems, and developed methods for assembling spacecraft in orbit. Skycorp co-started the Lunar Orbiter Image Recovery Project (LOIRP), which worked to recover and resurrect the only remaining tape drives capable of playing the only remaining master tapes of the 1960's era Lunar Orbiter Program.. There are no international partners or benefactors with whom Skycorp operates. For the ISEE-3 Reboot project, Skycorp has brought together a small, experienced team from academia and industry. 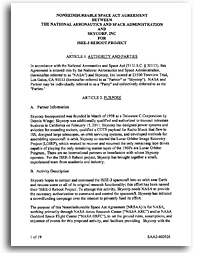 Continue reading NASA/ISEE-3 Reboot Project Space Act Agreement. "Using a custom-designed transmitter from Dirk Fischer Elektronik of Germany, the ISEE-3 Reboot Project led by blogger Keith Cowing and businessman Dennis Wingo has established two-way communications with the old heliophysics observatory, Wingo wrote in an online post May 29. The good news is that the spacecraft, launched in 1978, is now in engineering telemetry mode, meaning controllers on Earth can assess the health of the satellite and its instruments. A three-person team awakened the dormant ISEE-3, which is in its heliocentric orbit, using the Arecibo radio telescope in Puerto Rico, to which the German-made transmitter was affixed. " "Thorny problems arose almost immediately. NASA long ago abandoned the technology to communicate with ISEE 3. It no longer had radio dishes rigged to transmit and receive at the right frequency nor the programs needed to command the craft. 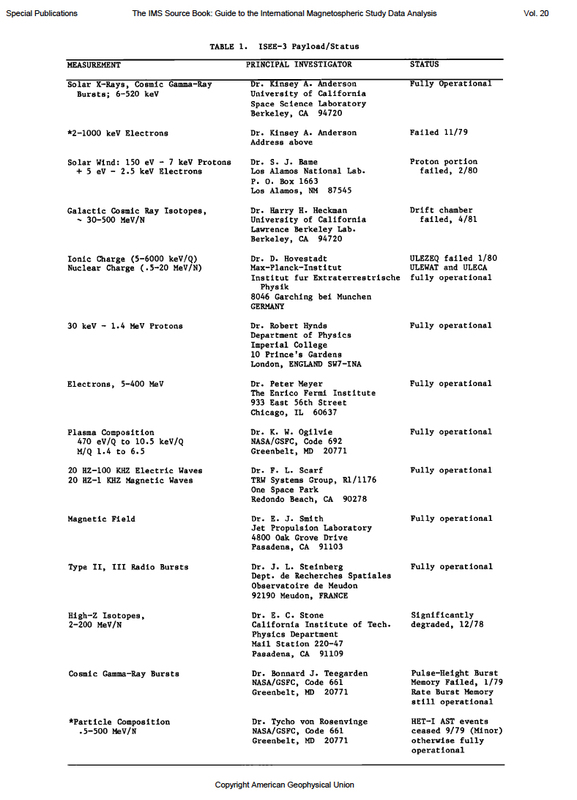 Also, NASA managers weren't really interested in spending time or money to reestablish contact. Ground controllers last contacted the craft in 1999, ostensibly for the final time, but they neglected to turn off its carrier signal. None of this dissuaded the craft's would-be resuscitators, a team of engineers, programmers, and scientists led by veteran spacewatchers Dennis Wingo and Keith Cowing and collectively known as the ISEE-3 Reboot Project. Yesterday the group proudly tweeted, "SUCCESS! We are now in command of the ISEE-3 spacecraft!" "Days ago, in a move that many people doubted was even possible, they made two-way contact with the almost-36-year-old spacecraft, and they've declared themselves "in control" of it as it rapidly approaches its home. The moment is undeniably cool: Using old-fashioned archival sleuth work, citizen scientists hack their way into an abandoned space object. The team, led by journalist Keith Cowing and space engineer Dennis Wingo, hope to make almost all the data from the ISEE-3 public, and to create a scientific community around the decades-old probe." Dennis Wingo: We have returned from our foray (probably not the last) at Arecibo. It was a wonderful trip, the people down there are marvelous, and Arecibo is the crown jewel of American radio astronomy. Did you know that the Chinese are building a bigger one, modeled after ours? The NSF keeps trying to cut their budget but this is truly an amazing asset to the American people and the world and it should be supported!! I want to thank Mike Nolan, Phil Perillat, Dana Whitlow, Victor Negron, and all the great crew down there. 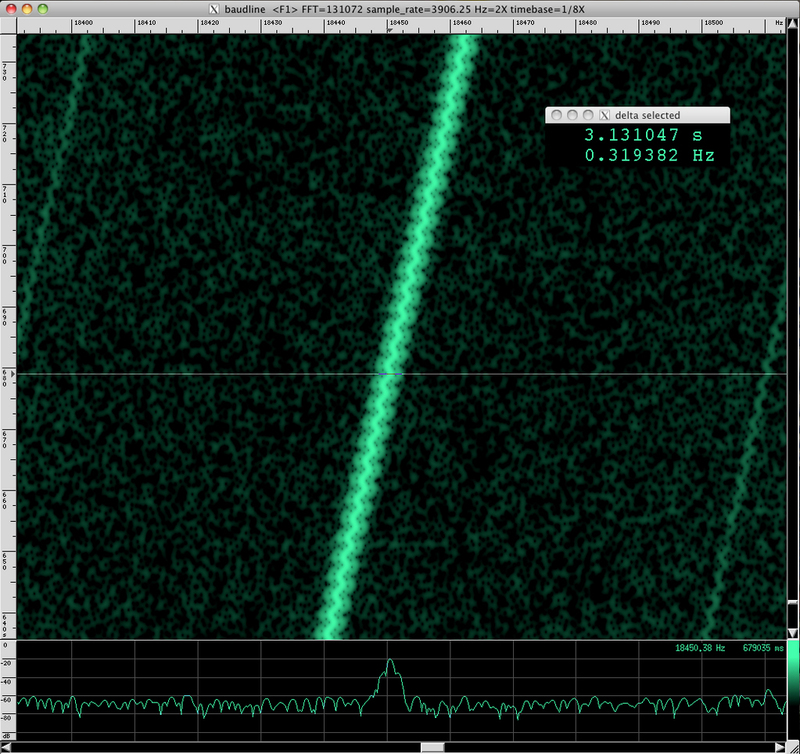 Continue reading ISEE-3 Reboot Project Update: BULLSEYE! and More.